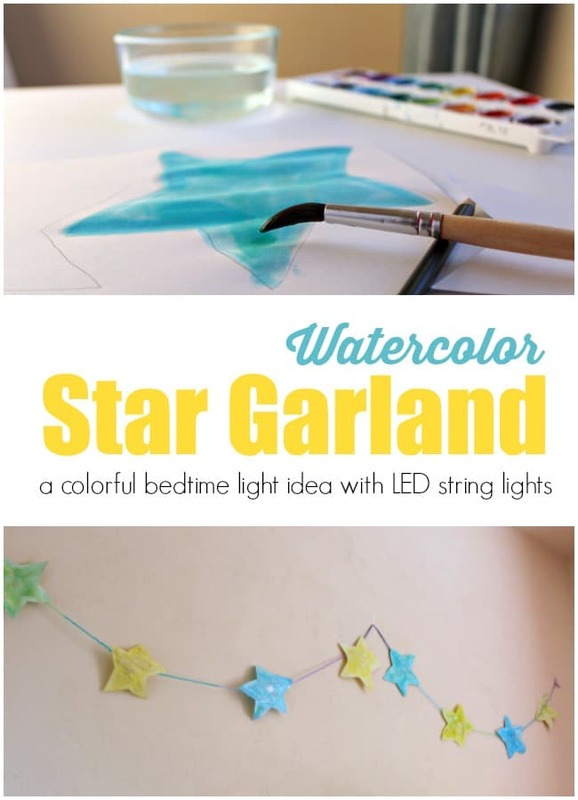 Create a colorful star themed night for bedtime with your child with this star garland. A creative way to decorate your child’s room for bedtime and think of loved ones. 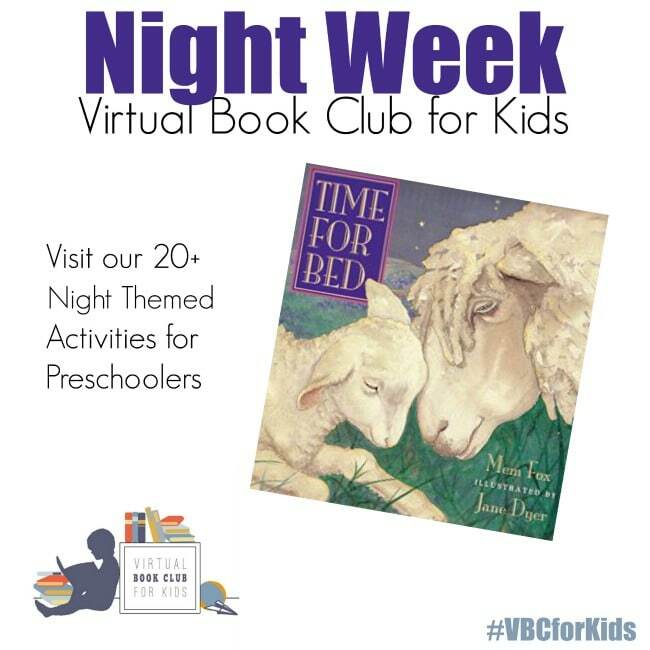 This week at the Weekly Virtual Book Club for Kids we’re featuring a night theme. During this time of year at times for preschoolers this can be the stage where night can bring some anxieties. Talking about it and finding special ways that families say goodnight can be a helpful way to assure them that all is safe. 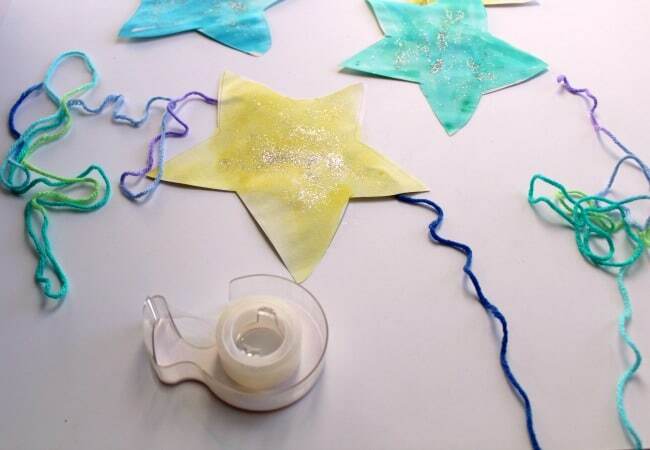 We’re choosing a special star banner to create with our featured story of the week. Did you grab the November & December Book List ? Our featured story is Time for Bed by Mem Fox. In the story night time is falling everywhere and the little animals are getting sleepy, feeling cozy, and being tucked in. It’s time for a wide yawn, a big hug, and a snuggle under the covers–sleep tight! The soothingly repetitive text, each page conveys a warm feeling of safety and affection. A perfect bedtime routine story for Preschoolers and Toddlers. 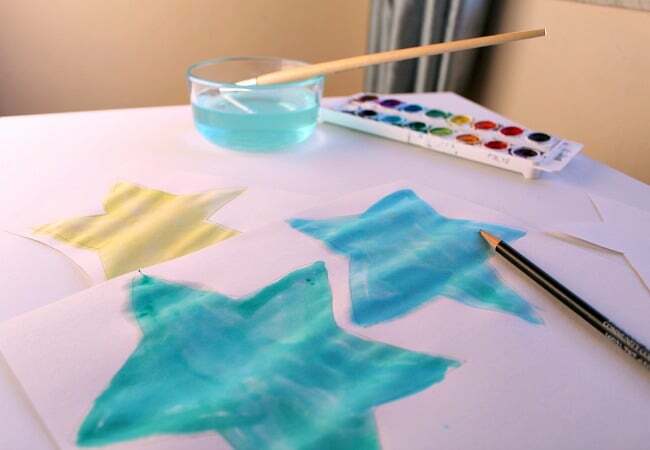 Here’s how to make your colorful star banner to go along with the Night Theme. Have your child trace an outline of stars onto cardstock paper. Make around 20 stars. 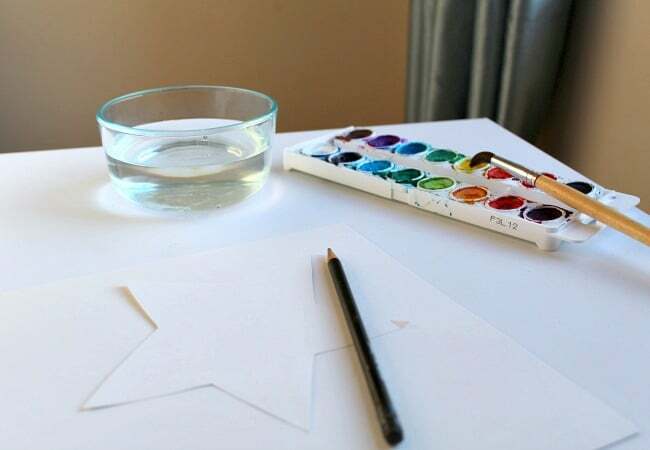 Have your child use the water colors to paint each of the stars. 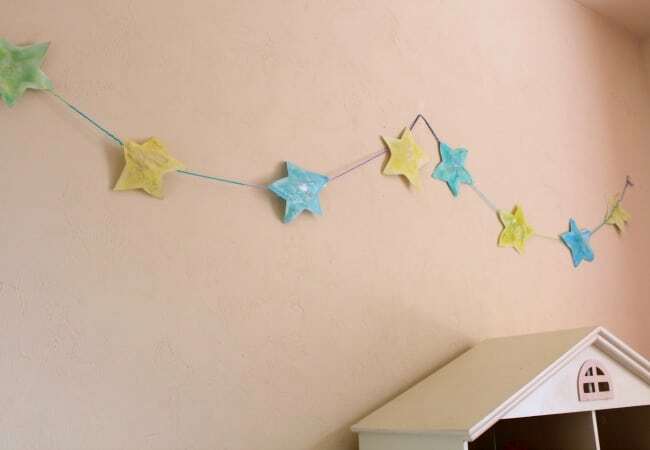 Encourage them to use one color per star to make it a colorful star garland. For younger children, you can have the stars pre-make on the paper. Tracing is a good way to practice fine motor skills and pre-writing skills with your child. 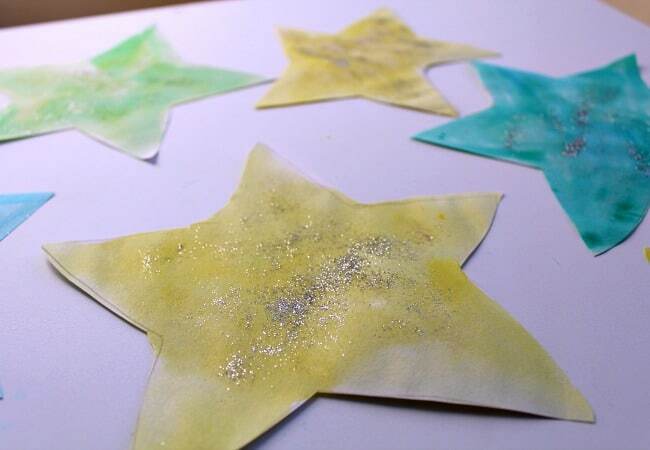 Allow watercolor stars to dry. Now using child safe scissors have your child cut out the stars. For younger children, they will need adults to help. 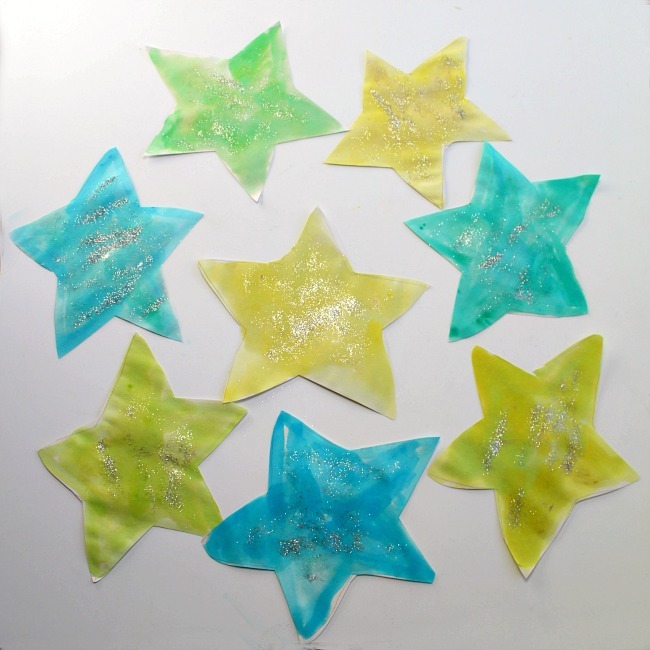 Then using the glue stick, encourage your child to apply glitter onto the stars so that they sparkle in the light. We covered two stars at a time with glue sprinkled one with glitter and then put the other one on top to try to keep control of the glitter mess. You could cover with contact paper as well to avoid the glitter from coming off over time. Measure and cut the string for the length of the space you want your star garland to cover, we did 9 feet as that is the length of our LED lights. Lay out your string and space out the stars across the string by placing them underneath, front side down. Now using the tape attach each star to the string. You could also use a hole puncher and string the stars onto the star garland for additional fine motor skills practice too. Hang up your Star Garland and attach the LED lights. to make it sparkle in the night. To make the star garland tie into the story of Time for Bed you could add each of the animals from the story in between each star. In case you need the animals and their order it goes… goose, cat, cow, foal, fish, sheep, bird, bee, snake, pup and deer. The repetitive language of the story along with the rhyming words make it a great one for retelling again and again and you can use these animal photos to do that as you get ready for bed. I love this quote at the end of the book, we added it onto one of our stars on the star garland in the middle. Sweet dream my darling, sleep well... goodnight"
Here are a few more books about Night Time that your child may enjoy reading as they settle into their night time routine. We’re excited to be in our 7th week of Virtual Book Club for Kids for 2016-2017. This season we’re hosting weekly themes and books. You can check out what’s next week here . YOU’RE INVITED. We’re inviting you to join along and share your own night themed ideas with your child or students using the featured story Time for Bed or one of the other Night Books mentioned above. You can share on our facebook page or join our VBC Facebook Group. 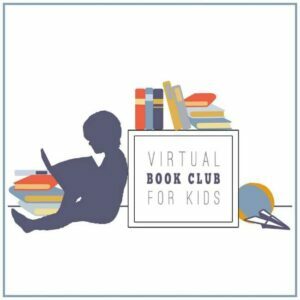 VIRTUAL BOOK CLUB HOSTS: Plus we’re inviting you to visit our Virtual Book Club for Kids cohosts sites for additional activity ideas all about Night. I’m featuring them below here for you to go check out and get ideas for your preschooler ages 2-5. I invite you to go check out our Virtual book Club for Kids cohosts below and the activities that they are sharing below for you and your child that are all night themed. Which Night Activity will you try first? Be sure to share in our VBC Facebook Group. This would look great at a party! Great craft for kids!